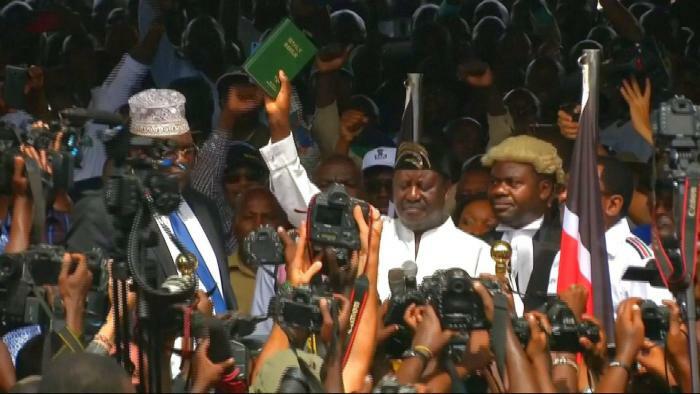 Wednesday January 30, 2019-Self declared National Resistance Movement (NRM) Leader, Miguna Miguna, has revealed in his new book: Treason: The Case Against Tyrants and Renegades, how ODM Leader, Raila Odinga, almost cancelled his own swearing-in as the People’s President. According to Miguna, Raila was so afraid of the repercussions that would emerge as a result of his swearing in following threats from President Uhuru Kenyatta’s Government. “Raila was dissolving in fear, right before us. He was scared to death of the high treason charges Uhuru Kenyatta’s minions like [Attorney General] Githu Muigai had threatened us with,” Miguna writes. He noted that the controversial swearing in not only caused a rift in the NASA coalition but was also opposed by some of Raila’s close family members, among them his wife Ida and his elder brother Oburu Odinga.